As some of you knew, I won a baking competition recently and one of the gifts was a course voucher at Academy of Pastry Arts. At first, I thought, the voucher will be wasted as I need to travel to KL again to attend it, and time plus distance didn't seem to permit. Things happened with some twists and turns... I managed to grab a course on a weekend where we happen to be in KL for a wedding. And it was the right course, chocolate class. Of all the things that I can learn by myself, this is the one thing that I truly dare not attempt, Chocolate Tempering. It was an enjoyable 2-day course and I learnt the most important thing of all, how to temper chocolate. Besides that, I took home with me 6 delicious recipes, plus a big box of handmade chocolates! FYI, that was REAL chocolate. Not the same like the budget friendly compound chocolate that I normally use that can be melted and used as I like it. Couverture chocolate is a bit temperamental to use, but absolutely delicious to eat. I knew that one day I will want to make them again since they were delicious! But since this recipe came from a baking school, it's not very nice to publish their recipes without permission, as this is their coursework. Just to be safe, I asked the Chef whether I could share them on my blog, and he said, "Go ahead. What is important are not the recipes, but the skills. People come here and pay to learn the skill, not buy recipes." So, here is a beautiful recipe from Academy of Pastry Arts, but.... so so sorry, I used compound chocolate as I can't get couverture here. 2. 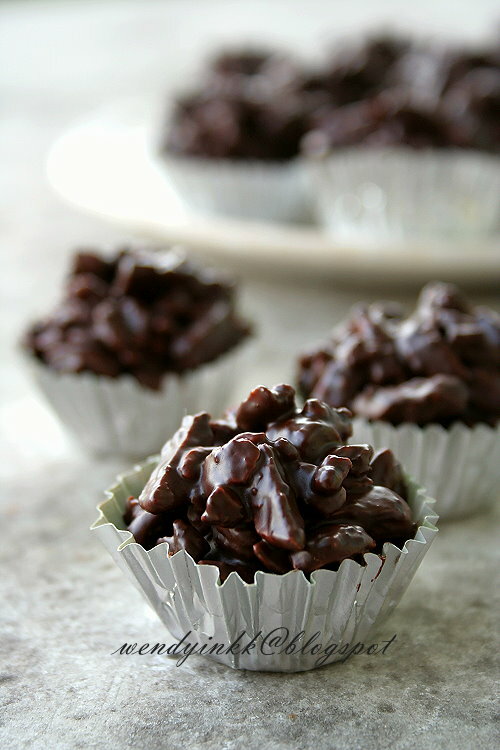 Mix almonds with rice bubbles, set aside. 3. Mix sugar with egg white. Pour in the almonds and rice bubble and toss to combine. 4. Pour this mixture onto tray and bake for 15 minutes. 7. Meanwhile, melt dark chocolate. 8. 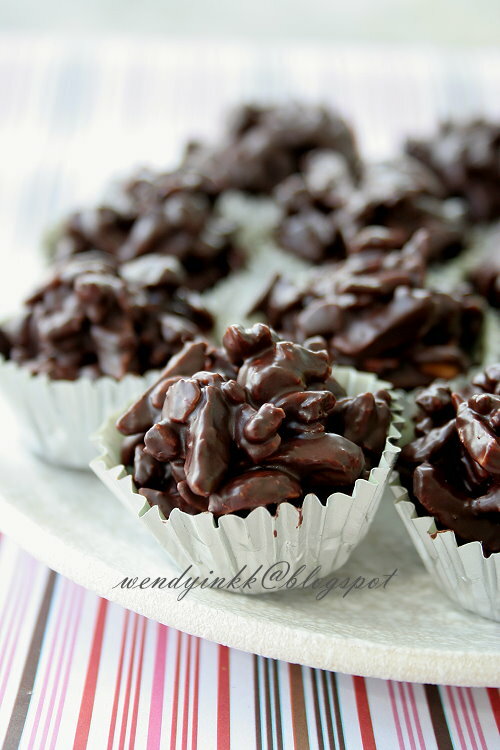 Mix the almond bits with the chocolate. I almost wanted to stop after baking them to a crisp and just eat like that cos it's soooooooooooo delicious! 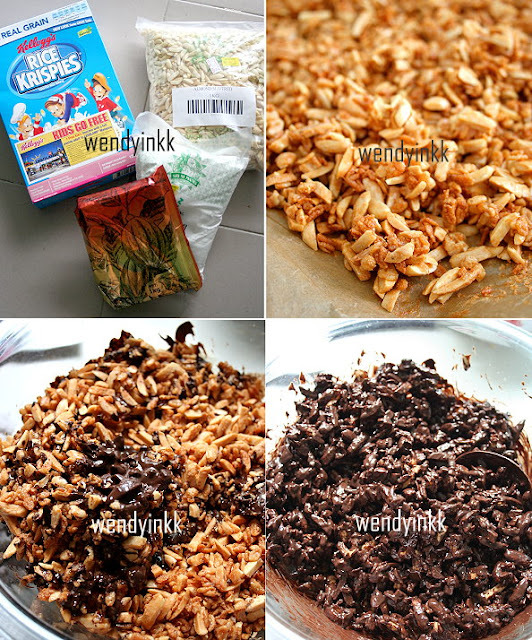 The rice crispies gives it a beautiful crunch and also reduces the 'sharpness' of the slivered almonds. Thank you for sharing recipe, this is giving me an idea what should I do with the (un-famous)rice kripy brand that my daughter wont eat :) - good thing I no need to wasted them. 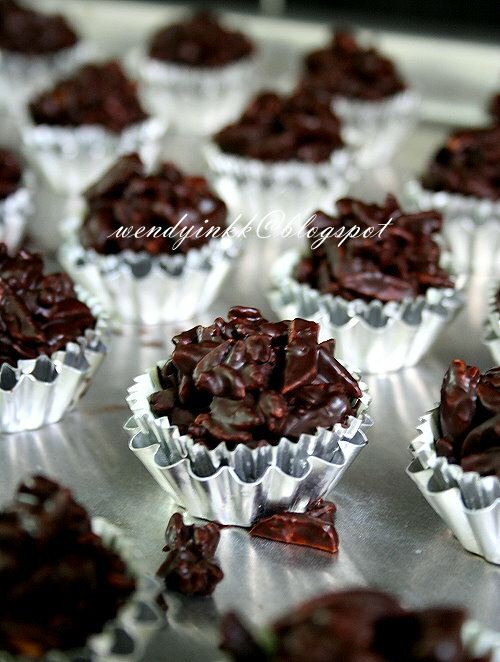 Very nice crunchy chocolaty delight! I think I will just cedok and eat by the spoonfuls hah! hah! Thanks for sharing the recipe, the step on mixing sugar and egg white, need to beat the egg white with the sugar or just mix the egg white with the sugar till the sugar is dissolved? Been following your blog for while now and have also tried some recipes. It all turned out well! 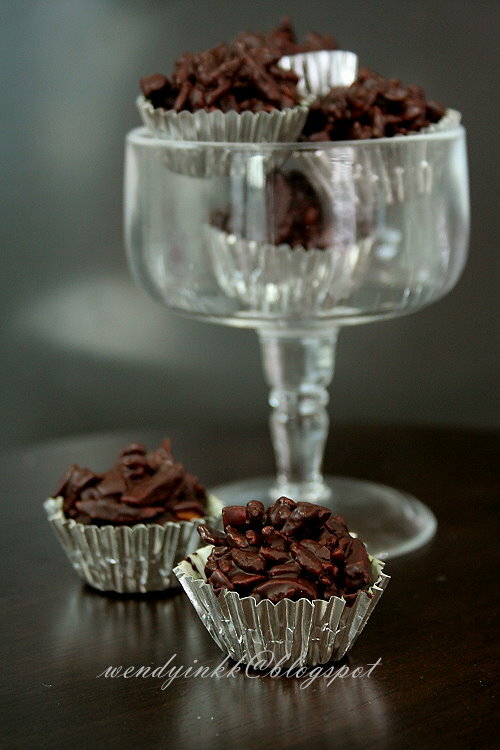 Would like to ask if these chocolate treats can be kept at room temp? Or would the chocolate melt? And if I were to use chocolate couverture, can I use double boiling method/microwave to melt it and use it as per the recipe? Can do marshmallow treats too, then you can use up more! I wanted to stop after baking, cos it was soooo good! Just mix. Icing sugar dissolves almost instantly. I'll say beat when it's beat, don't worry. Depends on how much is your room temperature. Mine is 28C and they still look good. Couverture chocolate if not tempered properly will not set. It's not just melt and use. If you want to melt and use, stick to Compound. Crispy and nutty treats. Must be good! Wendy, l love that glass shot. BTW, will these melt under our humid weather? I kept mine is tupperware at my room temp 28C, ok.
You can get it from Pastry Pro, ask them to give u a good brand. Sorry, but I am assuming you have never used couverture since u have no brands on mind? Correct me if I am wrong. Thanks Wendy for your prompt reply. I have never been to Pastry Pro because I reside in Shah Alam. Yah, you are right that I have never used couverture before but I know something about chocolate having worked in an oil and fats company before, that's why I will not buy compound choc because it has transfat being in cocoa butter subsitute (CBS) or cocoa butter equivalent (CBE).These are actually hydrogenated fats. Anyway, tks for your generousity in sharing all your lovely recipes that works having tried many of them. God bless. Made it last year, google it again for this year Open House, thanks for the recipe!